Performed by Alacie and Lucy, these chants, sounds and stories bring to life the nature, land and animals distinct to arctic lands. This album was awarded the “Best Traditional Album-Historical” at the Canadian Aboriginal Music Awards ceremony in Toronto. 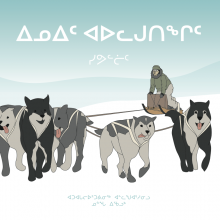 The recording features 14 of their performances, including long and difficult songs, such as “Piaramit Inaqutik” and “Qimminilapik,” which highlights the pair’s unparalleled skills. For those who seek to discover the unknown, this CD provides the listener with an unforgettable experience. Alacie and Lucy are Inuit women from Puvirnituq, Nunavik. They are considered to be among the best throat singers of the Arctic. They strongly believe in keeping the Inuit Tradition alive with Katatjaniq, throat singing, which is why they teach young people to pass it on to the next generation. Alacie and Lucy learned how to chant at the ages of 9-10 from their mothers and grandmothers. They first became partners in the 1970’s and since then have travelled around the world. Many of the songs are imitations of animals, and these songs have been sung by their mothers and their mother’s mothers before them. Back then they were mainly chanting during gatherings, celebrating someone’s first animal catch when the men came back from hunting. The mothers would also chant to help put the children to sleep. But now it has become so popular that they have been travelling around the world giving performances. In the 1990’s they both appeared in the movie Agaguk starring Lou Diamond Phillips. They have travelled across North America, Europe, and beyond in over 10 countries giving throat singing performances. Alacie Tullaugaq was born April 20, 1935 in a camp close of the actual village of Puvirnituq and has always lived there to this day. She has been married since 1955 and is the mother of 8 children and 2 foster children. She has taught many children between the age of 6 to 11 years old. Lucy Amarualik was born October 16, 1934 in Kangirsuruaq, a camp close to the present-day community of Puvirnituq. She married in Puvirnituq in 1955 and had 8 children. She passed in 2005.